free immune boost | To Health With That! I *love* *lovelove* free things that work and this is one of the best – it’s called wet socks or wet sock treatment and it is just as odd as it sounds, but it’s an awesome lifehack immune boost. First I’ll tell you how to do it, and then I’ll tell you why you might want to, because god knows anything to do with wet socks doesn’t really sound like something you’d want to do. I promise, it is. Plain cotton socks – any height but try to at least cover your ankles. Wool socks that are as tall (high?) or taller (higher?) than the cotton socks. Really try to get wool because it stays cozy even when wet. Find some plain cotton socks and run them under the faucet so that they’re fully wet. Go to bed and get a great night’s sleep. Your feet will feel cold when you go to bed – that’s totally normal and they’re supposed to. If you wake up int he night you will either be far too cold or far too hot, and far too hot is probably more common. That’s okay – just roll over and go back to sleep. This will be an uncommonly good night of sleep – seriously. You will wake up with toasty warm, mysteriously dry feet. This is THE BEST FREE IMMUNE BOOST EVER. No joke. Essentially by making one part of your body cold while the rest of you is a normal temperature you are tricking your body into freaking out. Essentially your body can’t figure out what is wrong, so it starts to heat up your core temperature hoping to save your feet. At the same time, you boost your white blood cells in order to go out there and figure out what’s wrong. If they happen to stumble across other things that have nothing to do with your cold feet, like say the flu virus or a cold or that sinus infection you just can’t shake, well then all the better. If you can’t make time for a full night’s sleep – you’ve got to give your body enough time to work on this. If you are taking prednisone, other steroids, or immune suppressing drugs because they will suppress your body’s response. If you try wet socks and wake up in the morning with the socks still wet – this means your body just isn’t generating enough heat right now to do this thing properly. Easy wet socks for you to try at home. This really is the best free immune boost ever. Working with your body and with your immune system in this way means that you increase your bug-resistance and can stop the early phases of viruses or bacteria in their tracks because your body goes on high alert quickly. It’s so simple and it’s so brilliant. 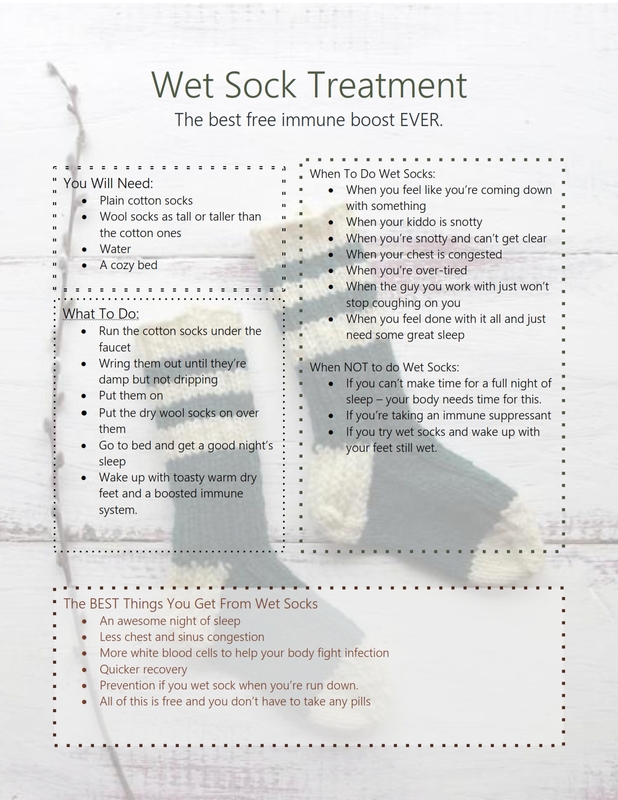 Wet socks or “wet sock therapy” is a great, easy, free lifehack immune boost. This entry was posted in Lifehacks, Natural Health and tagged at home hydrotherapy, best free immune boost, free immune boost, lifehack immune boost, prevent a cold, prevent the flu, wet sock treatment, wet socks on November 25, 2014 by amyneuzil.